I received these two gorgeous hair accessories for review from CoverYourHair.com. I really love CoverYourHair's products. They are well made and just adorable. As you can tell I really like pink and Gracie does too. So she was super excited about the zipper headband. She wears it all the time. I'd put up a picture of her wearing it...but I moved them to my external hard drive and I can't find the usb cord at the moment. Oops. :( And I don't have a picture of the other one because I've been wearing the sparkle headband and I never have pictures of myself. 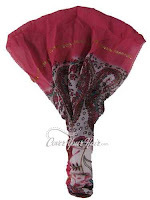 CoverYourHair has a large assortment of hair accessories such as hair clips, baby hats, baby headbands, snoods, head scarves, bandanas, and head coverings. I had a hard time picking out the ones above. BUY IT! : You can purchase these and more at CoverYourHair.com. WIN IT! 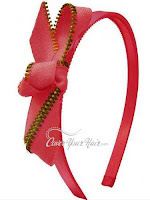 One lucky winner will receive a $25 box of surprise Hair Accessories. Visit CoverYourHair.com and leave a comment telling me which item(s) you would love to have. 1) Join CoverYourHair's Google Friend Connect: Go to http://www.hairaccessoryblog.com/ Click "Join This Site" in the Google Friend Connect box. 3) Follow CoverYourHair on Twitter. 6) Follow CoverYourHair on Networked Blogs, Go to http://www.hairaccessoryblog.com/ and click "Follow This Blog" on the Networked Blog box. Be sure and remember to leave a comment for each entry method. Also leave your email address so I can contact you if you win. Giveaway ends on February 13th at 11:59PM EST. Winner will be chosen using Random.org. I joined coveryourhair through GFC. I'm following coveryourhair through networked blogs. I fanned coveryourhair on facebook. I subscribed to coveryourhair on youtube. I'm following dragonflies n' daydreams on GFC.